Make your own dehydrated apple chips with just a few simple ingredients in a conventional oven or food dehydrator. It’s simple, cheap and delicious and they make the perfect healthy snack. Apple chips are quickly becoming a popular snack in grocery stores, health food stores and coffee shops. These delectable snacks are great for eating on the go – especially for hungry kids. The downside? While most are made with good ingredients, there are a few brands that have added sugar and preservatives. Plus, a snack bag can cost a small fortune – upwards of $3-5 for a two-serving bag (about 2 oz). 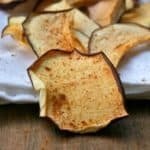 Homemade Dehydrated Apple Chips Will Save You Money Too! 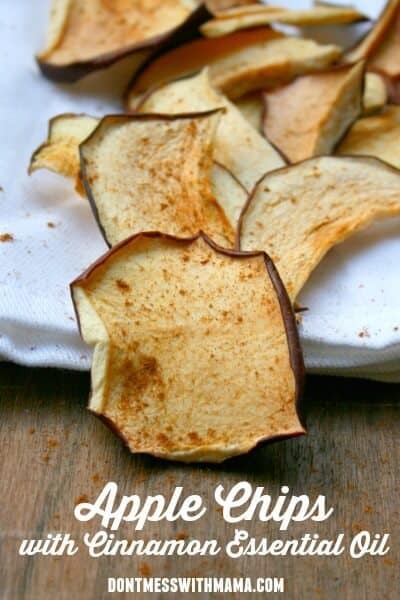 You can make apple chips for way cheaper and with wholesome ingredients in your own kitchen. An average medium size apple weighs about 7 oz. When dehydrated, that same apple weighs becomes about a little less than 1 oz of apple chips. So a 2-serving bag contains about 2 oz. of apple chips (or 2 apples). My recipe contains 6 organic medium-sized apples (about 42 oz), which will yield three times the amount of apple chips in a 2-serving bag at the store. I bought my apples for about $4 – even less when it’s on sale – and maybe another $1 for the other supplies in this recipe. Compare that with $12-$15 for the same amount of dried apples that I would have to pay at the store. BIG price difference. And my kids eat a LOT of apple chips. Plus, I know exactly what goes into my Dehydrated Apple Chips Recipe: organic apples, lemon juice, cinnamon essential oil and cinnamon powder. That’s it. If you’ve never used a dehydrator before, you’re missing out. I admit I was intimidated at first, but once I learned the basics I found that it was so simple to use. And you save a lot of money by making dehydrating your food – like apples, bananas, soaked nuts, jerky, etc. I get my baking supplies like baking soda, baking powder, vanilla extract, etc. either on Amazon or my local health food store usually. Excalibur Food Dehydrator – this is a top-of-the-line dehydrator with 9 trays and 15 feet of drying space. It’s ideal if you have a large family or garden and expect to do a lot of dehydrating. Or if you’re like me and have kids that just go through a lot of dehydrated food. Nesco Snackmaster Pro Food Dehydrator – this is a mid-line dehydrator with a lot of positive reviews on Amazon. It’s got 5 drying trays and 2 fruit roll-up sheets so you can make your own fruit snacks. You can make a lot of different foods – from dried fruit to jerky and more. Nesco Harvest Food Dehydrator – this is a great beginner dehydrator for a great price (under $35). It has 4 trays and can expand to 7 trays if you get the additional parts. 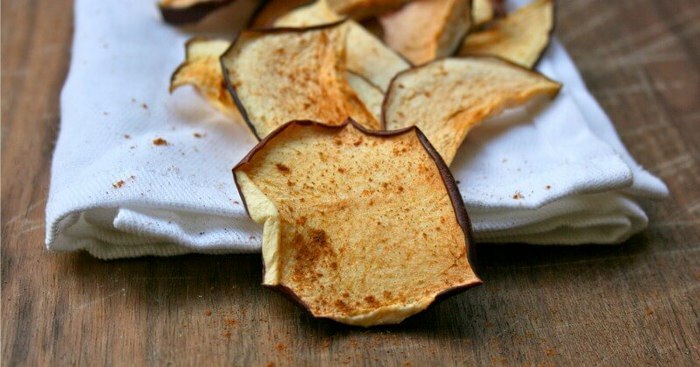 You can also make these Homemade Dehydrated Apple Chips in the oven. Follow the directions in the recipe below. Make your own dehydrated apple chips with just a few simple ingredients in a conventional oven or food dehydrator. It's simple, cheap and delicious. Wash apples using a natural produce wash.
Use a mandoline or sharp knife to cut apples into ¼-inch slices, lengthwise. Add Cinnamon essential oil to lemon juice. Drizzle apples with lemon juice to prevent browning. Sprinkle organic cinnamon powder over apples. Arrange on trays in a food dehydrator about ½ inch apart, and set to 135°F/60°C for 6 hours or until dehydrated. You can also bake in an oven. First, line a baking pan or sheet with parchment paper. Arrange apple slices about ½ inch apart, and bake at 200°F/95°C for 2 hours. Flip the apples and bake for another hour. Keep baking and flip until the apples become dehydrated (up to another hour). Remove apple slices from dehydrator or oven, and add to a large mixing bowl. Add cinnamon and toss well. Store in a reusable container or bag and enjoy! These sound delicious I’m always looking for healthy snack to try!